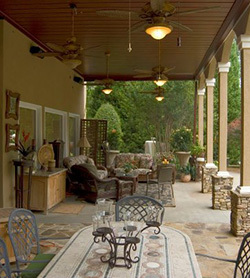 Outdoor living space is an often thrown around term. As you would expect it refers to outdoor areas that are as comfortable as a room inside your home. The biggest barrier to utilizing outdoor space is the weather. I'm sure many have experienced that unexpected rain shower that sent everyone in search of shelter. Outdoor furniture is made to withstand the elements but do you really want to sit on that wet chair? If you have a raised deck then K-Designers Ultimate Underdeck is the solution. It's a ceiling system that installs under your existing deck. Ultimate Underdeck manages the water coming through your deck creating a pleasing and dry environment underneath. It comes in a variety of colors including several woodgrain laminates for a very stylish look for your new outdoor space. If Ultimate Underdeck or any of K-Designers other home remodeling solutions interests you and you wish to know more. Give us a call 800-728-3902 or visit us on the web www.k-designers.com. Incredible high quality CR plastic product and incredibly enjoyable staff. Found the particular couch we were searching for recommend classic adirondack chair! They provide a multitude of furnishings and supply delivery as well. I'm pleased that we spent the time to stop through and look for their choice.